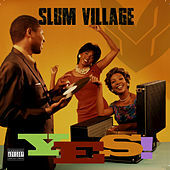 A much-lauded trio out of Detroit, and sometimes referred to as "the next Tribe," Slum Village have a warm and jazzy sound rife with vintage samples, deep bass and hearty, soulful grooves. Producer/emcee Jay Dee (well-known for his work with ATCQ, D'Angelo, Common and others) crafts mellow, buttery tracks while he, T3 and Baatin kick smooth flows. Laid-back yet hittin', Slum Village's tight joints are ideal for just kicking back and vibing to.